This page is intended to exemplify aspects of the Management of Health and Safety in Workplaces and to assist in education about, and practical implementation of occupational health and safety especially in "small and medium enterprises" of this type. 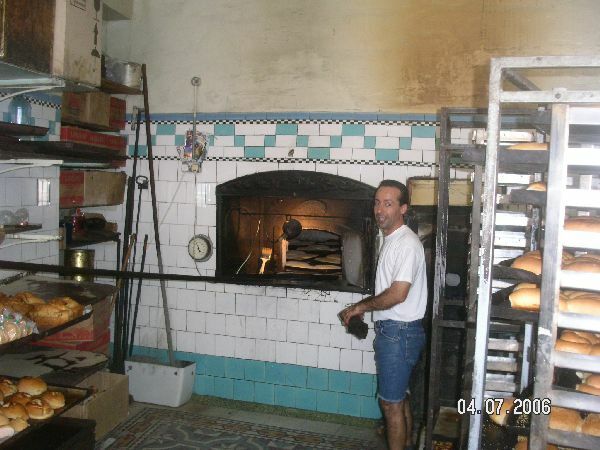 The heat associated with ovens in a bakery can be a hazard. employees may need time to get accustomed to this, and excessive heat can affect cardiovascular function for example, causing syncope (fainting) and other consequences. The image above shows a traditional bakery of a relatively small size where the staff were acclimatised to the temperature. The hazard of burns from hot objects or surfaces should be self evident. Sensitisation of the skin resulting in dermatitis, or of the nose and lungs resulting in allergic rhinitis or asthma, are important health hazards in the bakery environment. Notably, allergens may include amylase (enzyme) in the flour, as well as other agents, notably additives. 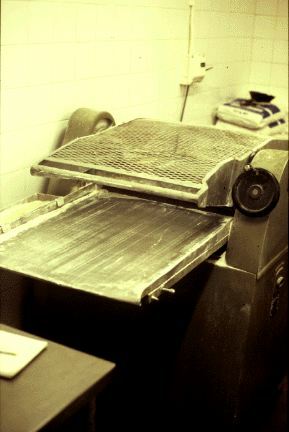 The photograph alongside shows a piece of equipment in a bakery, liberally sprinkled with flour. The risk of asthma is not trivial and many a baker have had to give up their work and suffer from persistent ill health as a consequence of inadequate control of exposure to allergens in workplaces such as this. This health effect was first recognised centuries ago - probably by Ramazzini and it is a shame that it still occurs in a significant degree in some bakeries. Occupational rhinitis may be a herald of the subsequent development of occupational asthma.